The speed is a major factor that can influence your search engine rankings. If your website loads fast, Google may place your pages on the top of the results and send more traffic to them. Page loading time is crucial not just for the search engines. It is applicable to your direct traffic too. People will wait for a few milliseconds to load a webpage. After that, they will move to another destination having similar contents. Such a sudden departure will affect your user experience negatively and increase the bounce rate. There are several things that cause slow speed issue on your site. The quality of hosting, image size, database optimization, and junk files are the common reasons for slow speed. Choose a fast and reliable hosting company who can deliver pages in lightning speed across the device types with 99.99% uptime. If your hosting provider does its job, we can tweak other parts with the help of plugins. Today we’re going to list 10 best WordPress plugins to speed up your website and rank higher in 2019. These plugins are of top-quality and can optimize your pages for ultimate performance to provide a better user-friendly experience to your readers. They will optimize your database, clear cache, reduce image size and do much more to improve the page speed and traffic. WP Rocket is a premium caching plugin for WordPress. It is packed with several exceptional features like various types of caching, database optimization, minification, lazy load, and many others. The plugin is easy to set up and you will see improvements in the page speed within a few seconds. W3 Total Cache is the most comprehensive caching plugin that you can use in WordPress for free. It provides several ways to optimize your website for enterprise-level performance and reduce the page loading time. You can clear cache, minify files and page types, and reduce download times using CDN integration of the plugin. It is a perfect tool to rectify Google Page speed insights errors and improves the user experience across the devices. WP Fastest Cache is a simple cache cleaner for WordPress. It is easy to use and you can clear cache, minify files, and perform other tweaks to reduce page loading time and speed up your WordPress blog. The plugin will delete your junk files when a post is published, updated or you can do it manually in one-click through the admin bar menu. 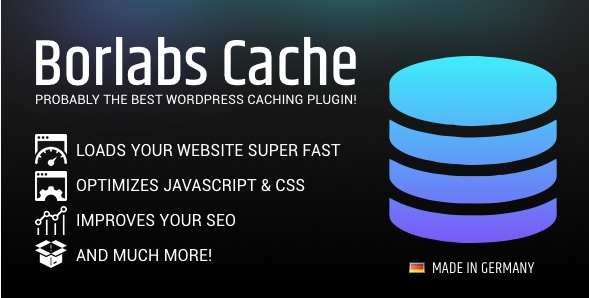 Borlabs Cache is another premium catching plugin to increase the speed of your WordPress website. It is simple, clean, and configure the plugin as own. It can cache your files, optimize database, lazyload images, and do several other things to reduce your page loading time and boost rankings. Hummingbird is a popular plugin to optimize your WordPress database and speed up the website. It comes with advanced controls to cache, minify, and compress files, optimize images and other assets to improve the user experience on your site. WP-Optimize is a great plugin to remove unnecessary data from your WordPress installation and run it at top gear. It can detect the garbage files that consume your server space and reduce the page speed. Set a schedule to clear them automatically or do it yourself in a single click from top of your admin menu. WP Super Cache is another popular and light-weight caching plugin for WordPress. It will generate static HTML files from your blog contents and serve those files instead of processing heavy PHP scripts. Thus this plugin can reduce your server response time and speed up the site. Smush is an intelligent solution to compress your images automatically and reduce their size. Set a default image size for different parts of the website and the plugin will do the rest. It will optimize your images in lossless quality and reduce their loading time significantly. Unlike other image optimization plugins, it also allows you to compress images in bulk quantity without spending a single penny. a3 Lazy Load is a simple plugin to speed up your WordPress website instantly. You can use it to lazy load images, video, scripts, and others which will become visible only when a reader scrolls down to them. It is highly customizable and lets you define the lazy load behavior in each part of the site like content areas, widgets, post thumbnail, gravatars etc. Autoptimize is a perfect plugin to optimize and speed up your WordPress site easily. It can minify, aggregate and cache your template files, defer scripts to the footer, optimize images and videos, combine Google fonts and remove query strings to enhance the performance of your website.